Luxury expedition cruise specialist Silversea has announced Silver Galapagos as the name for its second small-sized expedition ship, which is currently sailing as the Galapagos Explorer II. The new name signals the company’s intent to maintain a consistent level of elegance throughout its fleet, and will take effect after the all-suite, 100-guest vessel undergoes a major refurbishment in September 2013. In a related move, the hull of the Galapagos Explorer II has already been painted the same dark blue as Silver Explorer, the company’s other expedition ship. Silver Galapagos will be the only luxury expedition ship offering socially and environmentally responsible ecotourism to the Galápagos archipelago, a UNESCO World Heritage Site. This important distinction enables Silversea to broaden its portfolio of expedition cruises tailored to tap into the rising interest in green tourism. Sailing Saturday to Saturday roundtrip from Baltra Island, Silver Galapagos will trace a path across the western, southern and eastern islands, including Santiago, Bartolomé, Isabela, Fernandina, Floreana, San Cristóbal, and Santa Cruz. Sailing Saturday to Saturday roundtrip from Baltra Island, this itinerary encompasses the northeast, central and southeast islands of Santa Cruz, Genovesa, Seymour Norte, San Cristóbal, Española, and Plazas Sur. 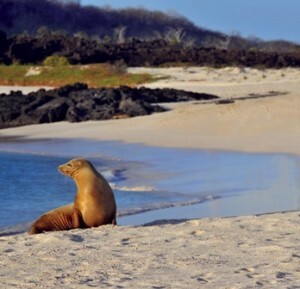 The 2013 Galápagos schedule offers adventurous travelers the life-enriching chance to discover a wild, pristine paradise that has long been regarded as a natural laboratory of evolution. On complimentary expeditions ashore guided by an experienced expedition team (certified by the Galápagos National Park Service), Silversea’s guests may experience up-close encounters with an abundance of wildlife that includes sun-basking land iguanas, giant tortoises, blue- and red-footed boobies, colorful marine iguanas, sea lions, penguins and Darwin’s famous finches. In true Silversea Expeditions style, the guests of Silver Galapagos will enjoy full-scale exploring from an enclave of luxury at sea that includes spacious, ocean-view accommodations, sumptuous gourmet cuisine, the personalized service of a butler, and a generous selection of all-inclusive shipboard amenities, including complimentary beverages, wines and spirits served throughout the ship, stocked in-suite beverage cabinet, and all gratuities.